In the middle of my day, I was feeling tight, a little overwhelmed and a little trapped by what felt like the enormity of the number and depth of tasks I needed to get through. I was time limited and scanning my repertoire for practices that would see me through this busy patch. Should I walk in nature? Should I go to the gym and clock some miles on the treadmill? Should I treat myself to chocolate ice cream? And then, quite by accident, I came across a YouTube video (the one below) that told me what I needed – I needed to cry. As I wholeheartedly cried in response to this video, I felt a release of emotion and resistance. I didn’t have any thoughts in my mind; I just relaxed and released. I cried for my own sense of pent-upness. Crying helped me to let go of the struggle to keep up with my schedule, and gave me an avenue to touch in to my inner self. I felt a new perspective come over me: I no longer felt resistance to my work, and felt a new sense of creativity, wonder and anticipation. My hope had returned. I was renewed. Crying meditation can be a powerful and cleansing practice to use when you’re feeling overwhelmed and pent-up with emotion and/or busyness. I use crying meditation regularly in my own personal practice – either to connect with my feelings about the common humanity in our experience of suffering, or as a way to release emotion pent up from my daily life. If you are prone to overwhelming sadness or depression, this is probably not a good meditation for you at the moment. Please check with your therapist, healer or teacher if you are unsure. Similarly, if you’re experiencing a current traumatic situation, you probably don’t need more stimulus for tapping into emotion. Once again, please check with your therapist, healer or teacher if you are unsure. Also, if you need to immediately move afterwards into a situation where you’ll have to put your emotions aside and “get on with the job,” it might be best to wait until you’re in a more personally connecting space. Alternatively, if you are sensing that there are some emotions that you haven’t quite been able to allow to surface, and you’re in a good space to support yourself emotionally, this might be a way to release those unexpressed emotions. Before you get started, find your favorite touching video or music track(s): you know, that one(s) that makes your body tingle and your emotions rise up through your being – I know you have them. With music, it’s not necessarily the lyrics that might be touching, maybe it’s the beat or the bass or the way the music is arranged that really moves you. See below for some of my favorites. Find a comfortable space where you can be alone for at least 10 minutes. It’s best to use headphones so that you can listen to the music deeply, hearing each nuance, every beat, every instrument. Headphones also help to drown out other noises in your environment. Play the music at a volume that is stirring – not too loud, but also not too soft. Simply sit and allow the music to fill your being. Give yourself over to the music. Allow yourself to feel and release any emotions that rise up, without getting hooked by any stories that arise with them. We’re focussing on the emotion in the body, not the story in the mind. Allow yourself to cry if that is what happens. Don’t suppress the tears. We cry when we feel safe and we cry as a way to release emotion. If you find your awareness has moved to thought or to analyzing the music or to judging your response, gently bring your awareness back to your body and allow it to have its experience. Once you reach the end of the piece of music, rest in your awareness. Notice how you feel. Be very gentle with yourself. If you feel there is more within you wanting to be expressed, you might play the piece of music again or play another, similarly touching piece of music. Your body will tell you if there is more to express. Make sure you rest at the end of this practice. You might even like to journal about your experience. Transition back into your usual daily activities gently. 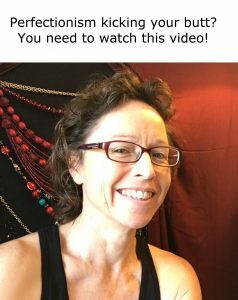 If you’d like to keep exploring your self-compassion practice, you might like to check out the Somatic Self-Compassion program or Thriving Woman Toolkit. I’d love to travel for a while with you on your practice path!